To say that academic elites don’t like ordinary folks is to state the obvious. To them, Lanford, Illinois—the fictional, archetypal, working-class town, made famous by Roseanne and Dan Conner—is not to be listened to, but tamed. A well-functioning democracy depends on it. Taming Fishtown—Charles Murray’s version of Landford—is the thread that seems to run through a new book, “The People vs. Democracy,” by one Yascha Mounk. You guessed it. Mr. Mounk is not an American from the prairies; he’s a German academic, ensconced at Harvard, and sitting in judgment of American and European populism. If only he were capable of advancing a decent argument. Strongmen are in power in several countries that once looked as if they were democratizing … The United States—the engine room of democratization for most of the post-war period—has a president who taunted his opponent with chants of ‘lock her up’ and refused to say if he would accept the result of the election if it went against him. Elites ensconced in the academy are likely selected into these mummified institutions for a certain kind of ignorance about political theory or philosophy. Notice how, deconstructed, nearly every utterance emitted by the technocratic and academic elites turns out to be empty assertion? Even the subtitle of the book under discussion is sloppy political theory: “Why Our Freedom is in Danger and How to Save It” implies that democracy is the be-all and end-all of liberty. Quite the opposite. America’s Constitution-makers did everything in their power (except, sadly, heed the Anti-Federalists) to thwart a dispensation wherein everything is up for grabs by government, in the name of the people. He has excluded Americans from the immigration, decision-making equation. But they, too, have been eliminated from decision-making on these matters. Perhaps the anti-populism tinkerer, for Mounk is no thinker, views the levels of “exclusion” in the US, on this front, as acceptable. The popular will is fine—provided it restores the obligations of government to its constituents, not to the world, protects nation-state sovereignty, respects the founding people of Europe and the West; and protects their traditions, safety and identity. For example, by eliminating the weaponization of political concepts against The People. In the context of immigration, constructs that have been weaponized are multiculturalism and diversity. If anything, populist leaders who want to denuclearize constructs which have been weaponized by the state are authentic leaders. The opposing elites are the interlopers. Your common, garden-variety academic is selected and elevated in academia precisely because of a pre-existing condition: a globalist, deracinated disposition. For that matter, humanity does not have a right to immigrate en masse to the United States or to Europe. There is no natural right to venture wherever, whenever—unless, perhaps, migrants can be confined to homesteading frontier territory. Regrettably, the developed world is running out of frontier territory to homestead. Besides, the only potential immigrants who still have that frontier spirit are South-African farmers. But American and European elites are uninterested in refugees who are ACTUALLY and actively being killed-off. Which “constitutional niceties” have populists dispensed with? Repealing statutory, man-made law the Left, invariably, depicts as fascism, when in fact repealing positive law is often liberating; strengthening the natural rights to life, liberty and the pursuit of happiness. 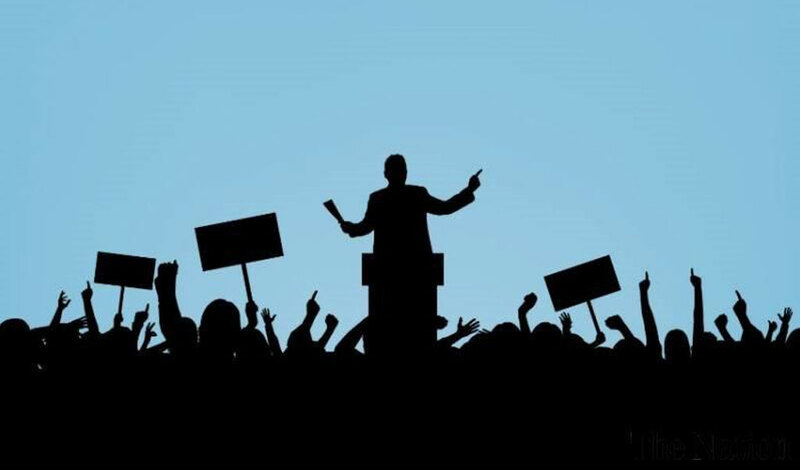 “Politics,” our author continues, “is defined by a growing battle between illiberal democracy, or democracy without rights, on the one hand, and undemocratic liberalism, or rights without democracy, on the other. It’s hard to know what to make of such bafflegab, only that the author’s political theory has been through the progressive smelter. Democracy unfettered—social democracy, Third Wayism—adopted by all “free” nations, the US as well, in antithetical to the liberty envisioned by the American Founding Fathers. Why so? Because in this fetid democracy, every aspect of individual life is up for government control. The very idea that a few hundred clowns in two chambers could represent hundreds of millions of individuals is quintessentially illiberal. And impossible. The kind of “undemocratic liberalism” the author sneers at is likely the classical liberalism of the 19thcentury, where the claims the mass of humanity could levy against individuals in a particular territory were severely curtailed, if not non-existent. Finally, what would an academic be without a brand of demeaning, economic reductionism? The lumpenproletariat are economically distressed. That’s Yascha Mounk’s final diagnosis. That’s why populism is surging. Tossed in their direction, Chinese-made trinkets will do wonders to improve the mood of this seething, racist, mass of Deplorables. Then Mounk and his friends can move in to make the right decisions for us. Harvard’s Chosen’s One chalks populism up to “the laws of globalization.” Deal with it or die. You see, working-class “losers” are being labelled illiberal fascists for—wait for it!—wanting a local economy around which to center flesh-and-blood communities. This populism-detesting academic (Yascha Mounk) is a theoretical utilitarian and bad one at that. He refuses to “grapple with the nuances” of the issues that make for misery or mirth among ordinary men and women. Instead, he grumbles that his gang of “technocratic elites” needs to moderate its ambitions, given that they’re not working with much (dumb Deplorables). Has the Globalist Establishment Defeated the Populist-Nationalist Revolt?